Transmissions of different constructions and with different tasks are mounted in automotive vehicles. They serve primarily for speed adaptation between the engine and the drive axle, for speed compensation between axles and wheels or for changing direction in the power train. It is differentiated between manual transmission, automatic transmission, double clutch, steering gear and hydraulic systems and between gears of cars and commercial vehicles. When choosing the right gear oil for oil change or repair of the gearbox, they play a crucial role. To gear lubrication, the most diverse supplies are used to meet the most important requirements for the type of gearbox. These diverse requirements of a modern transmission to the lubricant can only be met if, from an application engineering point of view, the correct lubricant is used in the required quantity in the permissible operating condition in the transmission. It is therefore important to pay close attention to the relevant specifications and OEM approvals for gearbox repairs and gear oil changes. Due to its special position as one of the leading lubricant developers and suppliers in the automotive industry, FUCHS offers the largest range of gear oils. In modern manual transmissions, in addition to classic wear reduction, the lubricant performs a wide variety of tasks and has an impact on ride comfort, as the quality of shifting is decisively influenced by the lubricant. Axle transmissions require particularly high wear protection (AW) and extreme pressure properties (EP). This is only possible with highly concentrated sulfur additives, which is why axle oils are not suitable for clutches or synchronization. In addition to high wear protection, axle drive oils must have good aging properties. Here, too, longer intervals between replacement and fill-for-life have to be achieved. With stricter directives and regulations concerning emmisions , the axle oils are getting more and more focussed for the efficiency optimization of the drivetrain. Important for the function of the automatic transmission is the coefficient of friction when opening and closing the oil lubricated lamellar clutches and brakes in automatic transmissions. This is exactly what automatic transmission oils need to be exactly tuned to. Especially because of different requirements of certain manufacturers of automatic transmissions on the coefficient of friction characteristic no general classification has prevailed. Decisive for automatic transmission oils are the OEM specifications. CVTFs are very similar to ATF oils, but in addition to the ATF properties, they are specially tailored to the friction properties required for contact between the metallic friction partners (variator to chain / transmission chains). Since CVT transmissions usually use strong hydraulic pumps, CVTFs must have particularly good foam properties and air release properties to prevent cavitation in the pump. Double clutch transmission fluids are the compromise between the characteristics of an outstanding MTF and a high-performance ATF. In addition, the use of hydraulic pumps increases the foam resistance requirements. Get an overview of our wide range of gear oils for passenger cars and commercial vehicles in our > product finder. 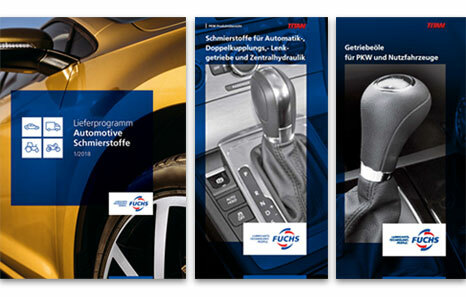 With the > oil chooser from FUCHS you reach step by step the optimum lubricant for your vehicle. You are looking for further lubricants, e. g. engine oils, antifreezes, brake fluids, etc. Please use our > product assistent. The first-filled automatic transmission fluid usually remains in the engine over the entire life of the vehicle. Only in the event of a repair of the gearbox there will be a gear oil change. FUCHS recommends a regular check of the oil level - preferably with every engine oil change in a specialist workshop. However, automatic transmissions and the used automatic transmission fluids are often exposed to difficult and severe conditions. High operating temperatures e.g. can lead to increased wear of the gear oil and to significant losses in shifting ease. In this case a change of the automatic transmission oil can lead to a significant improvement. But it is quite important that all the remains of the old filling are flushed out. FUCHS offers special equipment for all interested workshops. In any case, on the one hand the drain intervals of the manufacturer as well as the exact quantities are to be considered exactly. After all, automatic transmissions are very sensitive to both over- and under-filling. The FUCHS oil chooser offers you exact information about suitable automatic transmission fluids and the right quantities.